With an epic storm dumping nearly a year's worth of snow on the Buffalo area in just a few days and a weather system that sent temperatures in all 50 states to freezing or below, many Americans are wondering what's to blame for this sudden blast of cold -- and whether there could be nastier conditions on the way. Where did all this cold weather and snow come from? In a nutshell: the North Pole. John Koch, a meteorologist for the National Weather Service, told CBS News that the jet stream has dipped down from Canada across the central and eastern parts of the United States, carrying with it freezing air that originated very close to the North Pole. This has caused the dramatic drop in temperatures across the country. 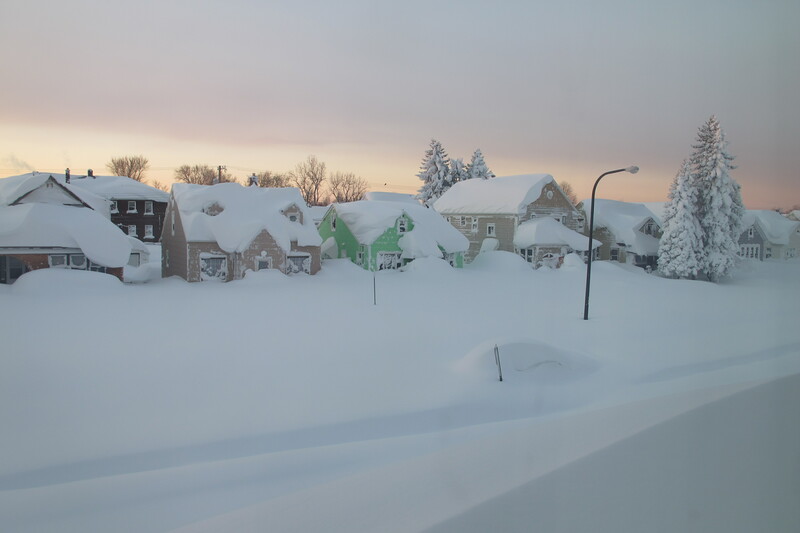 What is the "lake effect" and why did it cause Buffalo to get pounded with snow? "Lake-effects snow is a fairly common phenomenon in the Great Lakes region of the United States. That is the very cold air coming across relatively warm lake waters," Koch explained. While the Lake Ontario and Lake Erie hover around 50 degrees, the air above them is a good 30 to 40 degrees colder. That significant temperature difference creates instability, providing a hospitable environment for very strong snow squalls to develop. Is this the harbinger of a nasty winter? According to Koch, no. In fact, the National Weather Service is predicting a milder, wetter winter across the Northeast and Great Lakes. There may be a short-term change, as it will likely be a bit colder downstream from the hardest hit areas -- namely the Midwest and Plains regions and Buffalo -- because the snow cover will reflect sunlight, preventing it from warming the ground. Plus, the snow itself is cold, so as long as it's there, the air around it is going to be colder, too. But these changes, Koch said, "do not have any correlation to what we would expect a month or two from now." What role if any is climate change playing in all this? "Trying to tie climate change to any one event is very, very difficult to do and is something we try to avoid. Climate change is what you would expect over several years, maybe decades or centuries while this is a specific weather phenomenon occurring this week," said Koch. While a single storm cannot be connected to -- or blamed on -- climate change, some scientific literature has suggested that jet stream patterns can be affected by global warming. Will early snowstorms and cold become annual events? "Mother nature doesn't get classified into nice neat little bins," Koch said. "This could happen again two weeks from now. It could be five years. It could be 25 years. It has happened before and will happen again." In other words, this is an anomaly -- especially this early in the year -- and there's no particular reason to think that it is the start of a pattern.